Wendy from Guru Creations has been changing her focus and therefore selling off a lot of her work. I have managed to buy quite a bit of stuff that I'm looking forward to using over time. Here are two necklaces I've made recently. Both are simple but still a little different. This first one is an experiment. The circles of colour needed to be featured but I didn't want them to be over taken. What I decided to do, after attempts at Kumihimo and other braids, was a simple plait. Except that the amount of wires wouldn't fit through the holes of the beads. Hmmmm. So, ever the improviser, I made that a little feature too. I found tigertail in colours that were in the pendant, continued the circles in the round shapes of black glass beads, some faceted, some not, and this is the result. It's actually lovely and light and sits well on the neck. The second one I attempted began with the black lines on the glass. I've always wanted to achieve a simple spiral rope. Every other time I've tried the thread is too thick, the needle too big, and I haven't been able to pass through the beads enough times to make the spiral. This time it worked. Again, I found some beads in the colours used in the pendant. These are scattered throughout the rope. 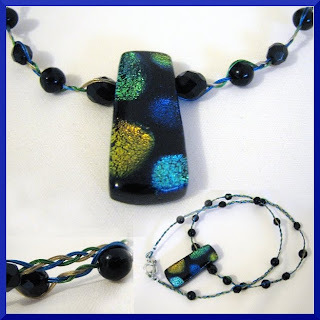 The main part of the rope is in various types of black seed beads. There are delicas and myuki beads used and several sizes also. After all, making a rope all the one size gets boring! I decided to see what would happen if I increased the number of beads in the outer beads. Once I reached the pendant I changed the size of the inside bead and kept increasing. 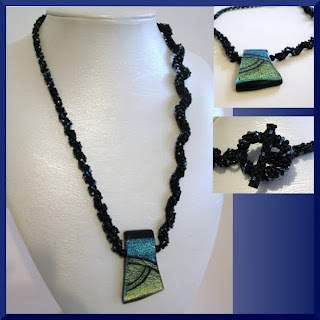 The asymmetry of the necklace is quite fun, I think and takes a simple piece just that little bit out of the norm. I'd love to know what you think of these necklaces. Also, I played a little bit more with arranging my photos. What do you think? I'd love to hear your thoughts and ideas in comments. Wow, this is beautiful and unique work. I know it takes time to "play" with materials, but that is how you come up with something truly stunning. Wonderful work! I am part of your web ring on Creative Bloggers, so thought I'd stop by. I will definately be back! Thank you for such a lovely comment, Cate. It's been so long since I've made anything. Life is crazy and I'm looking forward to being forced into updating my blog with the blog ring.